As we move into a digital age for moving images and people debate whether ‘film is dead’, the story of Gaumont Sound News echoes similar concerns, frustrations and debates as the advent of a new technology transformed the way that moving images were produced and distributed. This brief history of the newsreel traces its origins and the people involved, the problems of producing a regular sound issue and how it developed its distinctive style of rapid fire commentary. In May 1929 an advertisement by Gaumont British in the trade paper Kinematograph Weekly announced the production of Gaumont Sound News, designed to run alongside its silent newsreel Gaumont Graphic. The release of the first issue was scheduled for the beginning of June, with the Derby, a highlight of the newsreel calendar, as its centrepiece. All interested exhibitors were asked to direct all enquiries to 6 Denman Street, just off Piccadilly, where the Gaumont Film Hire Service was based. Gaumont Sound News was put together by a team already working on Gaumont Graphic. The news editor would be Keith Ayling, formerly film critic, aviation correspondent and special writer for the Daily Sketch, Sunday Chronicle and Sunday Graphic. Roy Drew was chief cutter. Existing Gaumont Graphic staff, such as the production manager HW (Bert) Bishop and the assistant manager Harold T Bromige, who handled all the news contacts, were given responsibility for the additional sound production. Expensive sound equipment, including vans, microphones and cameras for domestic coverage were purchased but it was soon evident that production had run into difficulties when the Gaumont released their ‘talkie’ Derby as an individual item. 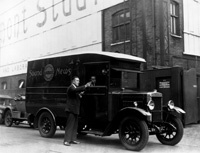 The race to produce the first British sound newsreel had been lost to Fox Movietone who released the first issue of British Movietonews on 9th June 1929. Movietone had won because they had mastered the new sound technology and it was an advantage they would maintain for years. Problems with synchronisation plagued the early months of Gaumont Sound News as its cutter Roy Drew recalled decades later. His first few weeks at Gaumont Sound News were actually spent at British Acoustic Films studying the process of sound on film. The British Acoustic method used by Gaumont meant that sound and picture were recorded onto separate films and then brought together, eventually using synchronisation machines. However, if the sound camera was operating slightly slower then this caused ‘quite a headache’, particularly given the time constraints under which the newsreels operated. ‘All the titles in this reel are accompanied by music which, being recorded on the film, naturally fits precisely the length of time the sub-title is on the screen’3. Although synchronisation was the main technical problem in the early days of British sound newsreels, there were others concerning, for example, film speed and the noise generated by arc lamps, which Gaumont sought to solve over the summer months conducting a series of experiments, probably in close conjunction with Gaumont’s ‘science department’ based in Sherwood Street4. Experimental items such as night shots of the Aldershot Tattoo were realised through the provision of a ‘fast’ negative made in Germany, designed to compensate for the reduction in exposure resulting from using the searchlights as the only form of illumination5. The noise created by arc lamps was finally solved in October when the first test editions of Gaumont Sound News were shown in trade shows6. The title sequence, of a ‘…a bulldog barking in the middle of the picture’ marked Gaumont’s credentials as the British newsreel. This national dimension would resurface periodically over the next couple of years as competition between the newsreels intensified. By the beginning of January the demand for Gaumont Sound News was such that the company announced the production of a longer, bi-weekly ‘super edition’ from January 20th, with a bi-weekly ‘ordinary edition’ in place from February 26th 8. The launch of three other British sound newsreels over the next year catalysed the development of a distinctive style as competition became more fierce. Pathe Super Sound Gazette, was launched on 2nd June 1930 to accompany the silent Pathe Super Gazette. British Talking News, the first talking newsreel recorded on disc, designed to fill a perceived gap in the sound market was released by Universal in June. This bi-weekly release continued alongside the silent Empire News Bulletin, which would still be supplied to unwired houses. 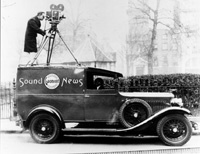 By September Paramount had already started to advertise Paramount Sound News, which would not appear until 2nd March 1931. In these early days Gaumont Sound News was an audible hybrid with the commentary vying with other natural sound and music and Emmett was one of several people used. It would take time before the newsreel found its voice and subsumed all other sounds to it but when it did, around 1933, it was Emmett’s rapid delivery and dry humour that would characterise it. By the time it had established its style some key personnel had changed leaving a team that would remain in place well into the next decade. Keith Ayling had moved to British Movietone at the beginning of November 1930 and had persuaded David Lean to join him a few months later in March 1931. This enabled Ayling’s one time assistant John O’Kelly to become an Assistant Cutter as Roy Drew moved up to become the Cutter. Ayling’s triggered a re-organisation within Gaumont with R.S. Howard now became editor of Gaumont Sound News in addition to Gaumont Sound Mirror, with Louis Behr promoted to editorial manager of the Periodical Department with H.W. Parsons and W.C. Gimber as associate editors. Bert Bishop was now known as ‘technical adviser’. This structure remained in force as Gaumont Sound News transformed into the tighter and more competitive Gaumont British News in 1934 under the formidable Castleton Knight. Real Reciprocity in Kinematograph Weekly, June 6th 1929 p. 29. Kinematograph Weekly, January 9th 1930 p30.